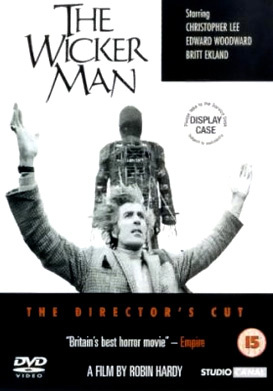 Where Catholicism and Paganism collide, there lies in waiting The Wicker Man. This extraordinary British film relates the story of a West Highland policeman (Edward Woodward) who flies his sea plane over some breathtaking countryside to a remote Scottish island to investigate a report of a missing girl. The protective locals initially refuse to send out a dingy to transport him to the shore but Sergeant Howie will not be fobbed off so easily. Much to his chagrin, everyone is evasive about 12-year old Rowan Morrison and her whereabouts – even her mother refuses to divulge any information. The clientele at the Green Man Inn respond to his inquiries with a bawdy song about the barman’s daughter (Britt Ekland) who receives young men in her room upstairs, offered up to her as sacrifices to Aphrodite. If left alone too long this saucy woman is liable to burst into song, start thumping the walls and slapping her naked flesh, which proves quite a distraction to the strictly Catholic Sergeant who takes up residence next door. This is just one of many unforgettable sequences in the extended Director’s Cut of this quirky film. There is also the ritualistic lesson in divinity conducted by the schoolteacher/ High Priestess, Miss Rose (played by Diane Cilento who later married screenwriter Anthony Shaffer and set up an alternative community of her own near Port Douglas). And Christopher Lee contributes what he deems to be his finest performance as Lord Summerisle, leading the community in their May Day celebrations to the magnificent titular Wicker Man. The burning of this huge wooden figure ensures a bountiful harvest but in the Sergeant’s eyes, it’s a gross heathen practice. In fact, the entire place disgusts him. If only he had heeded those locals and left the good folk of Summerisle alone!